While families wishing to see the world once relied on travel agents for their glossy brochures and recommendations, the internet has ushered in a new wave of travel planning independence. These days, more and more people are using the web to research destinations, plan itineraries, and book their own hotels. The freedom to research independently is a good thing, but there's also a problem: The American Hotel and Lodging Association (AHLA) reports that 55 million hotel booking scams are perpetrated against unsuspecting consumers each year. According to the AHLA, many hotel booking scams are set up so consumers don't even know they've been tricked. Most of the time, it starts with a hotel scam website being created and promoted so that it shows up in internet search engines right alongside legitimate hotel websites and third-party booking sites. 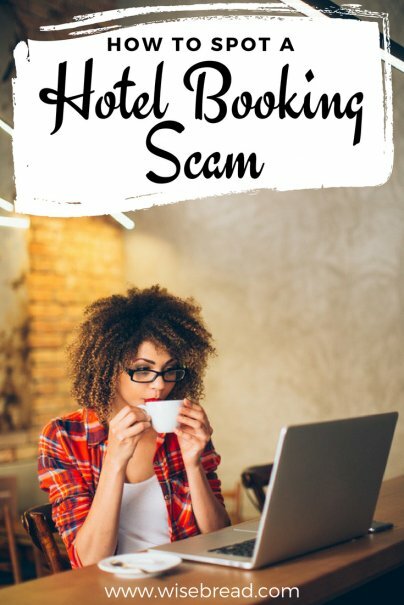 "These rogue sites trick consumers by mirroring the look and feel of the actual hotel website — using copyrighted images, trademarked logos, and many times, even similar URLs — to take consumers for a ride," writes the AHLA in a report about online booking scams. From there, the fraud committed can take on several different forms. The fraudulent website may steal the victim's money completely without making a hotel reservation on their behalf. Or it might charge the consumer an inflated rate that includes a giant commission the consumer shouldn't have to pay. At the very least, you may miss out on hotel loyalty points or perks you thought you were going to receive if you believed you were making a reservation directly with a hotel. The AHLA has partnered with the Better Business Bureau (BBB) to raise awareness about hotel booking scams with the goal of protecting consumers. According to Beverly Baskin, CEO of the Council of Better Business Bureaus, certain types of consumers are especially at risk for these scams, including travelers ages 55 and up and members of the military. Baskin says that travel and vacation scams cost the average victim around $847. Before you book a hotel stay online, make sure you are booking on the hotel's website. While a lookalike hotel website may have the hotel's name in their URL, double check the website address to endure it's not a third-party website trying to steal a hotel's identity. If you're booking with a large hotel chain, one way to do this is to visit the chain's website and make your reservation from there. If you're booking the Hilton Imperial Dubrovnik Hotel in Croatia, for example, go to Hilton.com and book your reservation on the main hotel website. You should avoid these third-party imposters at all costs. It's OK to use third-party websites like Expedia, Travelocity, and Priceline. Legitimate hotel booking sites can save you money and headaches. But you should beware of thirty-party booking sites you have never heard of. The BBB says you should never trust a website just because it looks legitimate. Take the extra step to check the company out with BBB.org and read online reviews before you book. If you're someone who likes staying with the big hotel chains (e.g. Hilton, Marriott, IHG Rewards, etc. ), it makes sense to sign up for the related hotel loyalty program. These programs are free to join and they typically offer the lowest rates to loyalty members who book direct. One of the best ways to avoid becoming the victim of a travel scam is to know what to look for. The BBB says you should avoid conducting internet searches for broad terms like "best travel deals" or "cheapest rates" since those type of searches tend to bring out the worst offenders among lookalike travel websites. If something seems off, the BBB says you should call the hotel and ask plenty of questions. The BBB says you should read all the fine print before you agree to a hotel charge being placed on your credit card. Will you need to pay upfront, for example? Or will your card be charged upon arrival? Is the hotel booking refundable if you need to cancel for any reason? While some big hotel chains and legitimate third-party booking websites offer discounts for non-refundable fares, it's more common for hotels to use your credit card to secure the reservation but wait to charge the rate until your hotel stay is completed. Hotel cancellation policies vary by chain, however, so make sure you know the policy ahead of time. Last but not least, you may get the best price on your hotel stay and other travel arrangements if you book far in advance. Planning ahead will also give you time to compare options, research hotel booking websites, and lock in a good rate. On the other hand, a last-minute, hasty search for a hotel may put you at greater risk for encountering a scam and losing money.